CryoProbe X - Dan Scott and Associates, Inc. Freezes tissue to -127 F.
Eliminates problems associated with liquid nitrogen. Distichiasis, Warts, Skin tags, fibromas, skin tumors, perianal adenomas, perianal fistulas, tarsal shield gland tumors, tumors of the mouth, eyelid tumors, papillomas, eosinophillic granuloma. 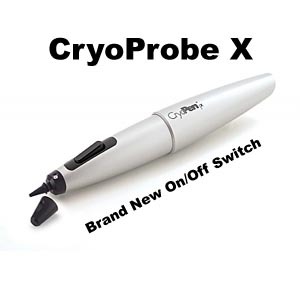 The CryoProbe is a great value as it is maintenance free, easy in its use, does not require anesthesia which is very important for elderly dogs and cats who can tolerate and appreciate the precise application of cryosurgery by the CryoProbe.